The Cricket World Cup 2015 has begun in Australia and New Zealand and already readers are searching for the best way to watch online. 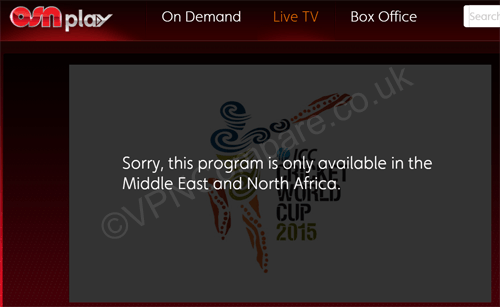 The first issue to understand is the ICC Cricket World Cup is not available on any free to air TV channels. Due to the popularity of Cricket and it’s growing spectatorship over the past few decades, cable companies are charging to view the sport. Cricket is one of those sports that you either love or hate, popular in countries such as England, India, Australia and elsewhere, there are many readers who have subscription services in their home nation, but are currently abroad and unable to access their own home TV services. With cable subscriptions being rather costly, it is a shame that most providers restrict online streaming access if you’re abroad. Luckily there exists a system known as a Virtual Private Network that allows you to disguise your location and give the impression that you’re in another location, this enables you to watch the Cricket World Cup 2015 abroad. All cable and subscription TV services that offer online streaming block access by the location of your internet connection. A Virtual Private Network, or VPN for short, allows you to give the impression to the streaming site that you’re in your home location. 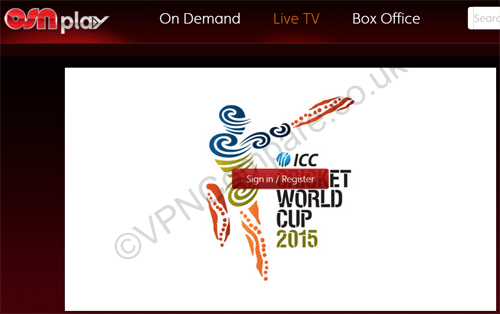 Lets take for example the UK, in the UK the Cricket World Cup 2015 is being streamed live on Sky Sports to subscribers. It’s possible to watch live online using their Sky Go system, but only if you’re in the UK. Using a VPN you can appear as if you’re in the UK, even if you’re in a completely different country, and it doesn’t matter what that country is. VPN services are offered by a range of companies and there are hundreds to choose from. For watching the Cricket I’ve been making use of IPVanish, the process is extremely easy and involves downloading their desktop software, installing and then within a click or two of a button, connecting to a server in the UK, I can then head over to Sky Go and watch the Cricket from my current location outside the UK. The process is exactly the same for other countries services. Australians outside of Australia can connect to an Australian server and watch on live.cricket.com.au if they have a subscription. Europeans on Eurosport 2, Pakistanis on PTVSports or Ten Sports and those in the Middle East on OSN. Plus a host of other countries offer online streaming services too! There are plenty of poor VPN services and some very good ones. For video streaming you’ll need a reliable provider that is also cheap. You’ll also need one that provides a server in a country of the site you’re trying to access. One I strongly recommend is IPVanish due to their mass of servers, they’re also competitively priced and most importantly fast for streaming video. There are a few other excellent providers who do a similar job which I also recommend. Each of the three listed providers offer easy to use software for most systems including Windows, Mac, Android and iOS. So for those who aren’t interested in the technical side, it offers an easy to use system that enables you to watch the Cricket World Cup 2015 from anywhere in the world. Sign up to IPVanish or one of the providers listed above. Download their software or app for the device of your choice. Connect to the country of your subscription service. Enjoy the Cricket from wherever you are in the world! You may of seen sites that stream the Cricket freely, but unfortunately this is a risky business. Any site that offers free streams when corporations are charging to view is not only an illegal site but also one that is likely to install malware or other nasties on your computer or phone, viewing free streams like this just isn’t worth the risk, not if you have a perfectly good subscription to a TV station in your home country that you can access easily with a VPN. Enjoy watching the Cricket World Cup from wherever you are and I hope your team wins!